BASSIAN, a Bishop of Lodi in Lombardy who attended the Council of Aquilia (381) with his friend St. Ambrose of Milan (7th December). St. Bassian reposed in 413. BRANWALLADER, (Sixth Century ? ), (also Branwalader, Branwalator, Breward and Brelade: it is also likely that “St. Brelade” is a corruption of “St. Branwallader”) was a Celtic or Welsh monk, who is said to have been a bishop in Jersey, although at the time Jersey would have been part of the ancient diocese of Dol. He has also been said to have been the son of the Cornish king, Kenen. As with many of the early saints of this part of the world, there is little reliable information extant. It is believed that he worked with St. Samson (28th July) in Cornwall and the Channel Islands, where the Parish of St. Brelade in Jersey is dedicated to him, as is the Parish of St. Breward in Cornwall. It is also possible that he travelled with St. Samson to Brittany, where he has sometimes been confused with SS. Brendan (16th May) and Brannoc (7th January). His feast was kept at Winchester, Exeter, and Cornwall (in Cornwall on 9th February and 6th June — 19th January most likely being the translation of his relics) at least from the tenth century. King Æthelstan (r. 924–939), founder of Milton Abbey in Dorset, obtained some of the saint’s relics (an arm or head), translating them to Milton Abbey in 935. The full name of Milton Abbey being the Abbey Church of St. Mary, St. Samson, and St. Branwalader. CATELLUS, (Ninth Century), a ninth century Bishop of Castellammare di Stabia on the Gulf of Naples. St. Catellus is said by some sources to have spent part of his life as a hermit on a nearby mountain. CONTESTUS, the Bishop of Bayeux in Normandy from 480 until his repose circa 510. It has been said that his dedication to, and strict preaching about, the proper way of life for Christians at times angered powerful locals to the point St. Contestus often had to go into hiding, living as a hermit, for his own safety. FIRMINUS, (Date Uncertain), the third Bishop of the now extinct See of Gévaudan in the region of Occitanie of present-day southern France. LOMER (LAUDOMARUS), a shepherd boy who became a priest, and then a hermit. In time a group of disciples formed for whom St. Lomer founded an abbey at Corbion near Chartres. St. Lomer was also known for his wonderworking. St. Lomer is said to have been over one hundred years of age when he reposed in 593. MARIUS (MARIS), MARTHA, AUDIFAX, and ABACHUM (ABACUM), a family of wealthy Persian nobles, who converted to Christianity. SS. Marius and Martha, husband and wife, along with their sons SS. Audifax and Abachum, went on a pilgrimage to Rome to venerate the tombs of the martyrs, and whilst there also participated in burying the martyrs of the current persecutions under Claudius II (r. 268–270). Soon this pious family was also arrested and martyred. SS. Marius, Audifax, and Abachum were beheaded, and St. Martha was drowned, 270. 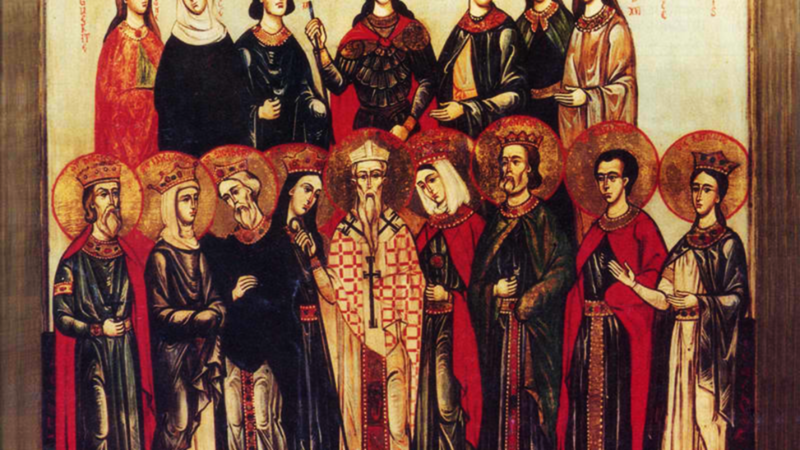 MARTYRS of NUMIDIA, (Second Century), an unknown number of martyrs in Numidia (present-day Algeria) of whom only the names of these nine are known: Paul, Gerontius, Januarius, Saturninus, Successus, Julius, Catus, Pia, and Germana, a disciple of St. Felician of Foligno (24th January), from whom she also received monastic tonsure. When St. Felician was arrested for his faith, St. Messalina visited him and having been discovered to be a Christian as well, was arrested, ordered to sacrifice to pagan gods, and when she refused, was beaten to death, 251. PONTIAN (PONTIANUS, PONZIANO), martyred at Spoleto in Perugia under Marcus Aurelius, circa 169 - 175. Nothing else is known of him, and in some source material he is confused with the St. Pontian (13th August) who was eighteenth Pope of Rome (230–235). REMIGIUS (REMI), a son of Charles Martel, and the third Archbishop of Rouen from 755 until his repose circa 772. St. Remigius was instrumental in implementing the Roman rite and chant in the Gallic church.